NJ Police are searching for the person believed to have left River to drown, trapped in a wire cage as the tide came in. He is now safe and sound. Jennifer Vaz was walking her own dog, Molly, near a New Jersey beach, when she heard whimpering. 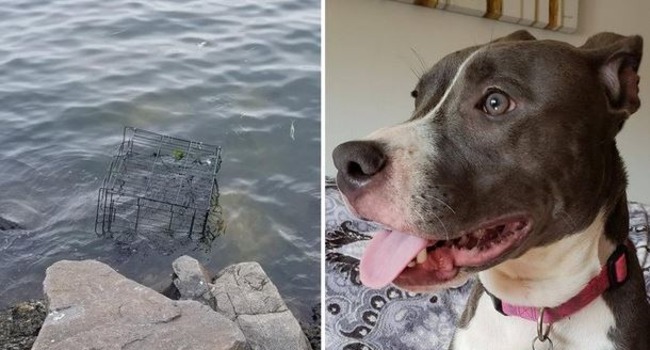 Below her, near the rocks and partially submerged by the incoming tide, was a cage with a 10-month-old pit bull inside. She immediately hopped the barrier to rescue him, calling authorities once she was home safe with the dog. Now the Monmouth County Prosecutor’s Office is investigating. Despite the ordeal, River, who was found in this cage, appears to be in good health. Vaz gave him the name “River” before she turned him in to authorities. She plans to adopt him. Jennifer Vaz, right, saved River. Now she plans to adopt him. 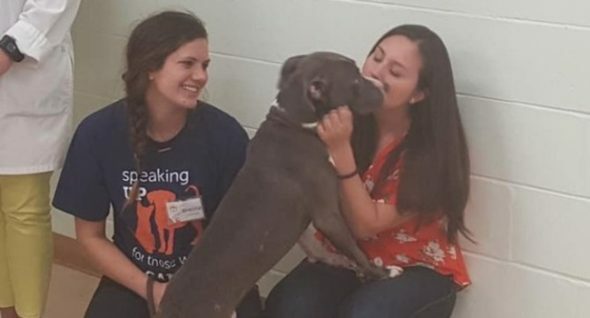 Prosecutors believe the dog may have been left there between 4 a.m. and 6 a.m. and says he is now in good health. Thanks GOD it was saved. May his new life will be better .